Appreciative Inquiry has touched and affected the life of thousands who apply its principles in a wide range of settings including industry, government, spiritual and not-for-profit organizations. The Advances in Appreciative Inquiry series advocates an organizational science that focuses on advancing a scholarship of positive human organizations, positive relationships and positive modalities of change, which promise to be of world benefit for individuals, organizations and communities. The book series is dedicated to building such a discipline through the advancement of Appreciative Inquiry as an approach to organizational inquiry and human development, and through the interdisciplinary articulation of non-deficit theories of positive change processes in human systems. Guided by the ethos of Appreciative Inquiry, the book series supports a relentless inquiry into the true, the good, the better and the possible. It is dedicated to advancing a "scholarship of the positive" and "positive scholarship." The book series aims to facilitate an emergent dialogue within the social sciences and to support innovative and challenging work. Setting the stage for the series, the first volume, Constructive Discourse and Human Organization, revolves around three main themes: We Live in Worlds Our Questions Create, Appreciative Discourse and Narrative, and The Design of Inquiring Systems. Introduction. 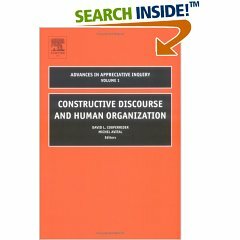 Advances in Appreciative Inquiry: Constructive Discourse and Human Organization. (D. L. Cooperrider, M. Avital). Part One: Extension of Relatedness. Appreciative Inquiry as Dialogue: Generative and Transformative. (M. M. Gergen et al.). Appreciative Inquiry in the Age of the Network. (J. Stamps, J. Lipnack). What Knowledge Management Systems Designers Can Learn From Appreciative Inquiry. (M. Avital, J. L. Carlo). Paradox and Organizational Change: The Transformative Power of Hermeneutic Appreciation. (T. Thatchenkery). Part Two: Activation and Elevation of Inquiry. With Our Questions We Make the World. (M. Goldberg et al.). Appreciative Inquiry and the Elevation of Organizational Consciousness. (D. Whitney). Appreciative Narratives as Leadership Research: Matching Method to Lens. (E. Schall et al.). Toward a Pedagogy of Appreciation. (L. Yballe, D. O'Connor). Ap-PRAISE-al: An Appreciative Approach to Program Evaluation. (K. E. Norum et al.). Part Three: New Metaphors of Positive Change. The Psychophysiology of Appreciation in the Workplace. (L. E. Sekerka, R. McCraty). Underlying Ritual Practices of the Appreciative Inquiry Summit: Toward a Theory of Sustained Appreciative Change. (E.H. Powley). Feedback From The Positive Question - The Integration of Appreciative Inquiry With Survey Feedback: From Corporate To Global Cultures. (P. F. Sorensen, T. F. Yaeger). The 'Artful Creation' of Positive Anticipatory Imagery in Appreciative Inquiry: Understanding the 'Art of' Appreciative Inquiry as Aesthetic Discourse. (N. Nissley). Sustaining positive change: Inviting conversational convergence through appreciative leadership and organization design. (M. J. Mantel, J. D. Ludema). Appreciative Inquiry in Transformative Public Dialogue. (J. Rodgers).